With the December 11 parliamentary vote on the Brexit deal looming, there were two key interventions this week that caused controversy. On Wednesday morning, the Chancellor Philip Hammond admitted that Theresa May’s current Brexit deal, as agreed with the European Union, would leave the economy “slightly” worse off than remaining in the EU. But this warning, coming alongside the Government’s official forecasts for EU exit, was overshadowed the same afternoon by the Bank of England’s economic scenarios for a no-deal Brexit. A disorderly Brexit would see would trigger the worst economic slump since the second world war, the Bank said, with an 8% drop in economic growth within a year. The Bank and the Government’s forecasts for lost economic output tallied with each other, but Threadneedle Street expects the rate of decline to be steeper than the Treasury is modelling. The headline figures were alarming to UK consumers and investors: a 33% fall in house prices, a collapse in sterling to below parity with the dollar, a hike in interest rates to 5.5%, and a nearly doubling in the unemployment rate to 7.5%. Stock and bond markets are expected to be highly volatile under a no-deal Brexit. While the Bank’s stress tests were intended as “worst-case scenario” the intense media reaction revived memories of “Project Fear” before the 2016 referendum. At the time the Bank’s Governor, the then Chancellor George Osborne, and the IMF predicted that voting Leave would inflict serious damage on the UK economy. Yesterday, former Monetary Policy Committee member Andrew Sentence said the Bank risks being accused of “getting unnecessarily involved in politics”, especially with the drama of the Parliament vote on Brexit still to come. “The Bank of England is undermining its credibility and independence by giving such prominence to these extreme scenarios and forecasts,” Sentence said on Thursday. City regulator the Financial Conduct Authority released its impact assessments for Brexit on Thursday, and stuck to the impartial tone adopted by the Bank. "As a public body, the FCA takes no position on the UK’s withdrawal from the European Union as such. Nor do we advocate a particular approach to withdrawal," the FCA said. Bank Governor Mark Carney reinforced the point in a BBC Radio 4 interview for the Today programme, where he defended questions from John Humphrys about which option he “preferred” by saying the Bank is “absolutely agnostic”. “Parliament demanded this analysis, but it is analysis with a purpose and the purpose is to get the system ready,” Carney insisted. Responding to criticism that these are "apocalyptic" warnings, Carney said in the interview that these should be considered “scenarios” of “what could happen if everything goes wrong” and not “forecasts” of likely events. Fewer than half of British businesses had put into place contingency plans for a no-deal Brexit, the Bank said, as it backed the transition period for allowing companies to prepare for EU withdrawal. Those searching for some positives in these scenarios could be reassured by analysis showing that the UK’s major banks all passed the stress tests for a no-deal Brexit. The Bank’s Financial Policy Committee said that UK banks could continue to serve households and businesses, even taking into account £70 billion of losses to the sector – a similar figure to the money spent bailing out Royal Bank of Scotland (RBS) and Lloyds Banking Group (LLOY) during the financial crisis. 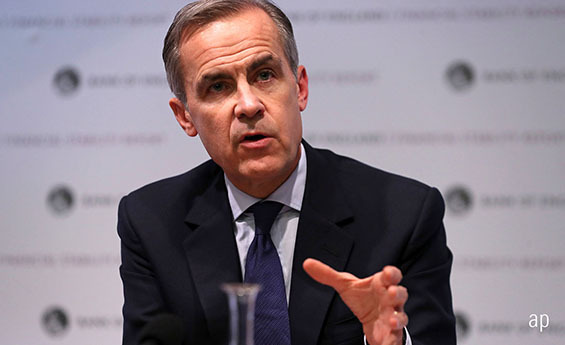 The 2008-9 crisis is the only comparably extreme period of recent economic history for a no-deal Brexit: the Bank expects the economic impact to be worse than 10 years ago, but Carney said the financial system is one area that people should not worry about with banks now much better capitalised. The Government is due to release individual assessments for Brexit scenarios in the coming days: Friday shows the impact on international trade, Monday December 3 will look at the effect on “Money”.